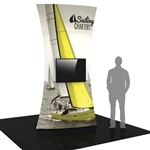 Tension Fabric Kiosk displays are very versatile displays. 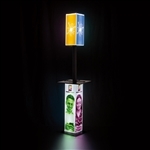 They are often used as stand alones but can also be incorporated into your exhibit booth along side your other displays. The dye sublimation tension fabric graphics allow for full customization.